Interacting with the legal system can be stressful and intimidating for mental health professionals. 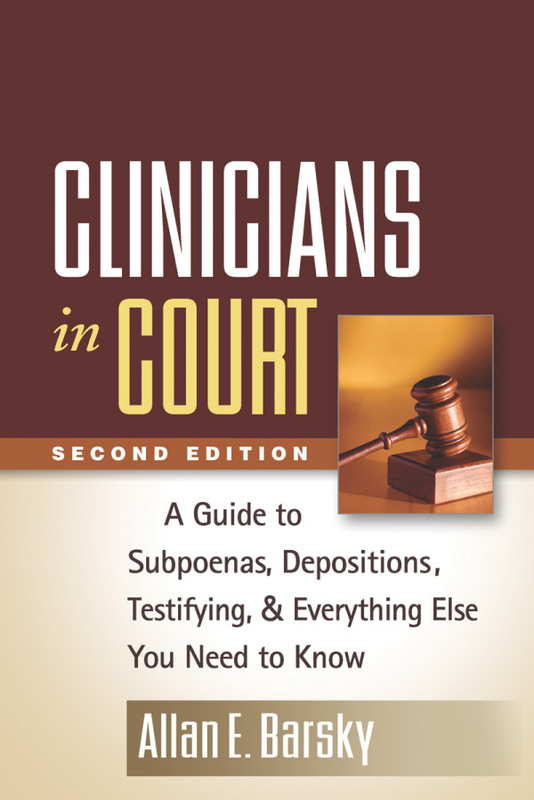 This trusted book provides user-friendly strategies to help clinicians prepare for testimony in court and other legal proceedings. Using vivid case scenarios, the author explains legal terms and offers practical suggestions for avoiding pitfalls and managing ethical dilemmas. Clear guidelines are presented for record keeping, responding to subpoenas, preparing reports, and performing effectively on the stand as a fact witness or expert witness. Reproducible agreements and other sample documentation can be photocopied from the appendices or downloaded and printed in a convenient 8½" x 11" size. Incorporates updates in research, case law, statutes, and practice. Examines the developing role of mental health professionals as forensic consultants. Increased attention to ethical issues, such as dual relationships, professional boundaries, confidentiality, and competence. An appendix with reflection questions that extend the scope of each chapter. Supplemental materials for course use—including an instructor's manual—are available at the author's website.